(Phys.org)—Using the Shanghai Tianma 65m Radio Telescope (TMRT) a team of Chinese astronomers has detected a widespread presence of glycolaldehyde and ethylene glycol around the giant molecular cloud Sagittarius B2. The finding, presented Sept. 29 in a paper published on arXiv.org, could be important for studies of prebiotic molecules in the interstellar medium. Sagittarius B2 is a giant molecular cloud of gas and dust with a mass of approximately three million solar masses spanning across 150 light years. It is located some 390 light years from the center of the Milky Way and about 25,000 light years away from the Earth. Its enormous size makes it one of the largest molecular clouds in our galaxy. Sagittarius B2 contains various kinds of complex molecules, including alcohols like ethanol and methanol. Previous studies revealed that this cloud exhibits a weak concentration of emission of glycolaldehyde (CH2OHCHO) and ethylene glycol (HOCH2CH2OH). However, the exact extent of this emission remained unclear. Thus, a team of researchers led by Juan Li of the Shanghai Astronomical Observatory, recently conducted new observations of Sagittarius B2 that independently detected the emission of these two molecules, and provided more detailed information about this process. The astronomers observed Sagittarius B2 with TMRT in March and November 2016. For these observations, they employed the telescope's digital backend system (DIBAS) with a total bandwidth of 1.2 GHz, and a velocity resolution of 2.0 km/s at a frequency of 13.5 GHz. The team detected widespread glycolaldehyde and ethylene glycol emission, also determining the spatial distribution of these molecules. "We report the detection of widespread CH2OHCHO and HOCH2CH2OH emission in galactic center giant molecular cloud Sagittarius B2 using the Shanghai Tianma 65m Radio Telescope," the researchers wrote in the paper. Glycolaldehyde is a sugar-related molecule that can react with propenal to form ribose—a central constituent of RNA. Ethylene glycol is a dialcohol, a molecule chemically related to ethanol. New observations made by Chinese scientists show that the spatial distribution of these two prebiotic molecules around Sagittarius B2 extends over 117 light years. Notably, this extension is about 700 times greater than usually observed in clouds located in the Milky Way's spiral arms. Furthermore, the study revealed that the abundance of glycolaldehyde and ethylene glycol decreases from the cold outer region to the central region of the cloud associated with star formation activity. According to the authors, this suggests that most of the emission is not associated with star formation and that the two studied molecules are likely to form through a low temperature process. In concluding remarks, the researchers emphasize the necessity of additional observations of other molecules in order to determine whether some other process are also engaged in the formation of complex organic molecules in the center of the Milky Way. 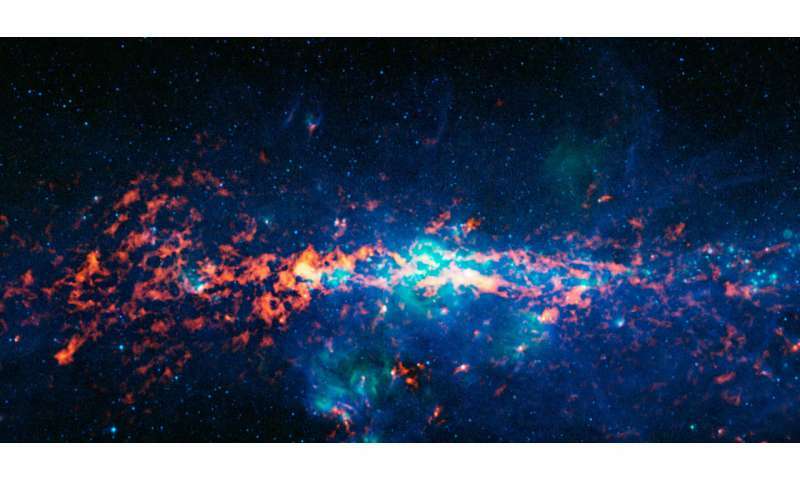 "Future observations of methyl formate are expected to investigate whether energetic processes also play a role in producing complex organic molecules in the Galactic center," the astronomers concluded. We report the detection of widespread CH2OHCHO and HOCH2CH2OH emission in Galactic center giant molecular cloud Sagittarius B2 using the Shanghai Tianma 65m Radio Telescope. Our observations show for the first time that the spatial distribution of these two important prebiotic molecules extends over 15 arc-minutes, corresponding to a linear size of approximately 36 pc. These two molecules are not just distributed in or near the hot cores. The abundance of these two molecules seems to decrease from the cold outer region to the central region associated with star-formation activity. Results present here suggest that these two molecules are likely to form through a low temperature process. Recent theoretical and experimental studies demonstrated that prebiotic molecules can be efficiently formed in icy grain mantles through several pathways. However, these complex ice features cannot be directly observed, and most constraints on the ice compositions come from millimeter observations of desorbed ice chemistry products. These results, combined with laboratory studies, strongly support the existence of abundant prebiotic molecules in ices.